(Newser) – The dinosaur was the size of a turkey and had a neck like a swan, teeth like a crocodile, forelimbs similar to a penguin's flippers, and clawed feet ideal for use on land. 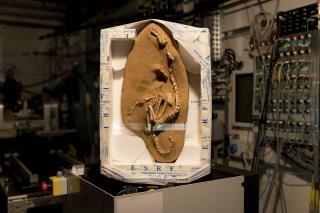 It's such a strange assortment of features that researchers who identified the new species from a fossil used X-rays to make sure the nearly complete skeleton wasn't a jumble of unrelated bones. "It looked like an alien," Vincent Fernandez, co-author of a new Nature study, tells the New York Times. "It's like a mixture of things that could have been put together." That was a legitimate concern, as the 75-million-year-old fossil found in southern Mongolia was sold on the black market before an international team of researchers got their hands on it. They say the fossil is indeed real and identify the creature as Halszkaraptor escuilliei, a relative of the velociraptor and perhaps only the second swimming dinosaur ever found. maybe it was an alien. It looks slightly terrifying like some sort of evil goose.